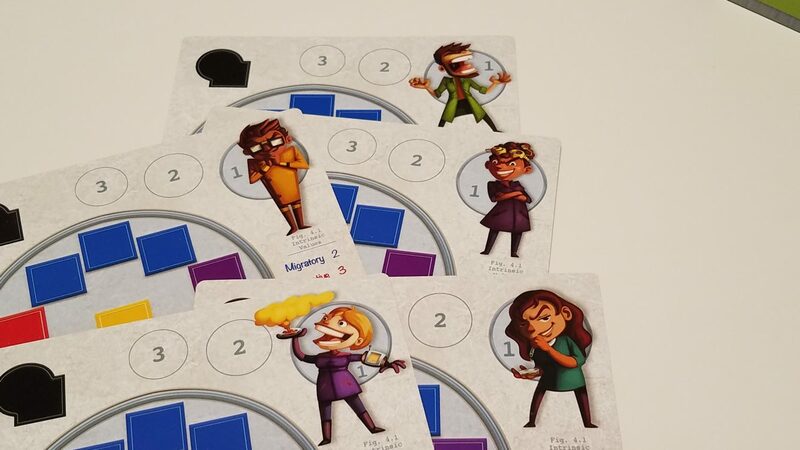 BIOTIX is quick, savage, and fun - sort of a knife fight in a petri dish. In BIOTIX, you and your fellow players will take on the roles of lab assistants – those hard-working devotees to science who toil endlessly over experiments and research opportunities. You and your colleagues have all been asked by the esteemed head of your department to assist in assembling data for her groundbreaking research project on the development of a particularly vicious set of microorganisms. Jess: That sounds awesome! Science rules, and it’d be really cool to help with an experiment and get credited on a research paper! Andrew: Totally!…But there’s a catch. Only the most successful assistant will actually get their data into the paper. And since science can be a pretty competitive field, well, you – HEY! What are you doing to my petri dish? Jess: Woops! Sorry, didn’t mean to accidentally knock it off the counter and into that incinerator. 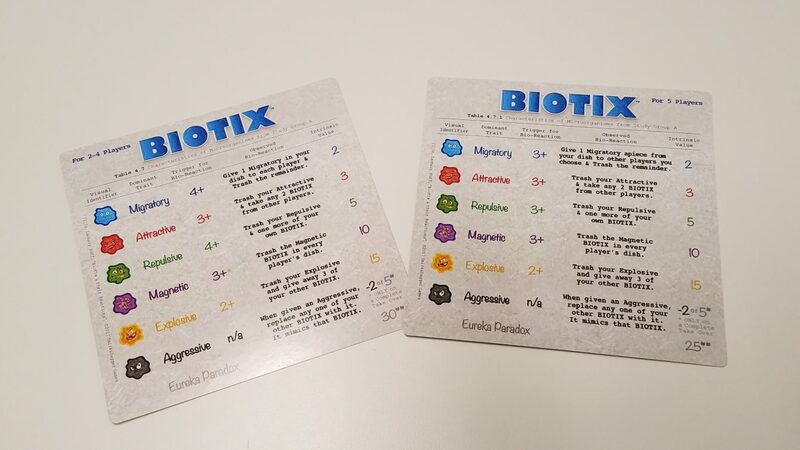 We received a review copy of BIOTIX from Smirk & Dagger. We were not otherwise compensated for our review. Behold! A bag full of biological nasties! 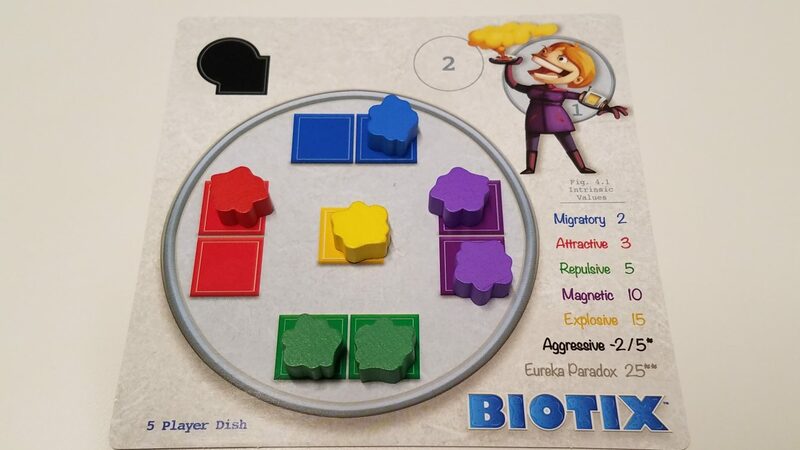 BIOTIX is a game all about carefully balancing the microorganisms in your petri dish, while trying to constantly mess with the balance of your opponents. 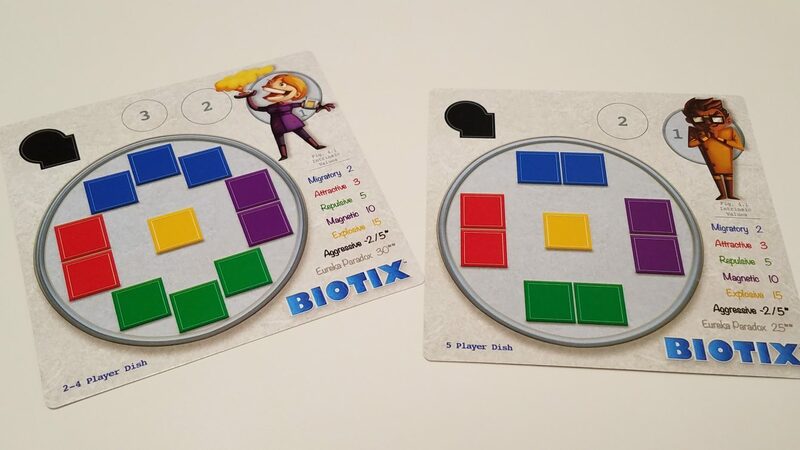 Each turn, a player will draw 2 of the titular BIOTIX from the specimen bag. Then, one at a time, they will either place the BIOTIX into their own petri dish, or give it to an opponent of their choice, who must place it in their own. Each of the six colors of BIOTIX must be placed in an appropriate space, and when a BIOTIX would be added beyond the number of available spaces, a reaction occurs. The effect of these reactions are determined by the color of BIOTIX. Aggressive (black, value -2) BIOTIX are special – they don’t trigger anything directly, instead replacing other BIOTIX on your dish, and are worth a flat -2 points regardless of their placement. The stickers intended to lend the BIOTIX some personality. 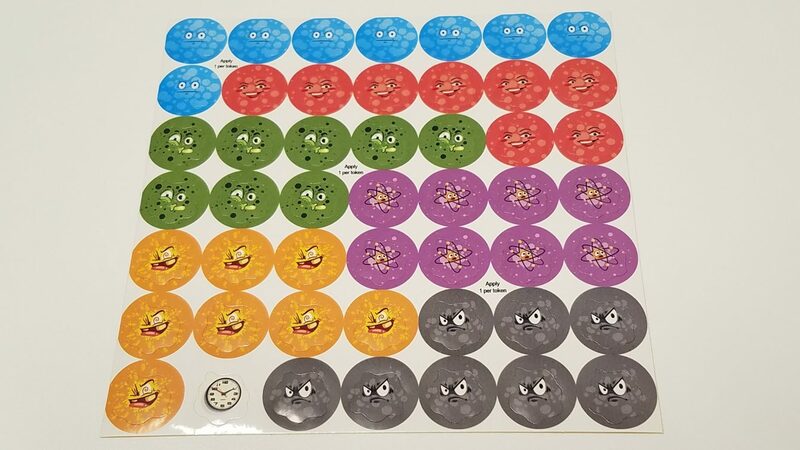 I didn’t sticker ours because I hate stickers. 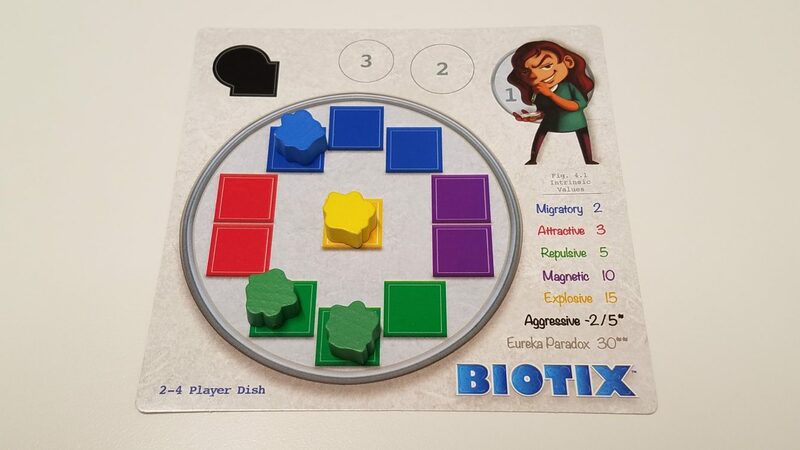 BIOTIX is played out over three rounds, with a constant churn of BIOTIX being added and removed from players’ boards. Scoring is conducted at the end of each round, and at the end of the final round, all scores are added up and we figure out whose name is going on this research paper! Jess: The fun of BIOTIX lives in the push your luck moments. BIOTIX is straightforward, but also actually pretty clever – each turn, you’ve got a random chance as to what to pull, and the strategy comes from deciding how risky you’re willing to be – for example, those Explosive BIOTIX are worth a ton of points if you can end the round holding onto one, but they’re also really easy for your opponents to blow up! Deciding when and how to take risks is at the heart of BIOTIX’s accessible, quick gameplay. Andrew: Not only that, but it’s more than just viciously satisfying to knock your opponent’s board out of balance – if you’re lucky with your pulls and smart with your placement, you can often force your opponents to not only trash their own points, but you can take advantage of certain bio-reactions to make them hand you points! Is it mean? Heck yeah. Is it still fun? Heck yeah it is! See, the truth is that around Gameosity HQ, we don’t all enjoy games that feature really aggressive gameplay. But the fact is that BIOTIX somehow gets away with it – in part because there’s something strategically satisfying about dumping a viral load into your opponent’s board only to trigger a reaction that devastates the precarious balance they’ve build up, but also in great part because BIOTIX is pretty low stakes in a good way. 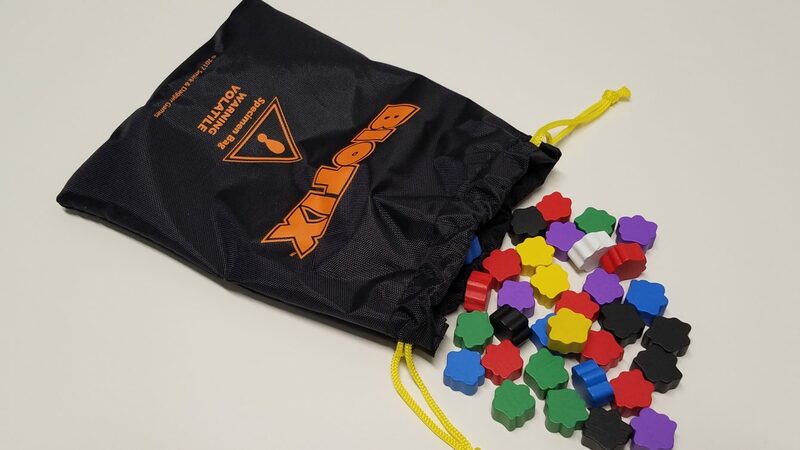 With virtually zero setup time, simple rules, and super-quick turns, BIOTIX takes all the sting out of getting screwed by the opposition, and multiplies the fun of managing to mess with them in return. The white BIOTIX acts as the game’s timer, getting added to the bag after a certain number of turns and ending the round abruptly when it’s drawn. More chaos! What BIOTIX isn’t, is deep – the ‘strategy’ we mention here is of the quick, situational kind. The randomness of the bag and the frequency of the sabotage makes it impossible to plan further than your current turn, and you’re really just keeping your plate as full as possible at any given time, hoping your opponents don’t kick it over just as the end of the round shows up (and they will). 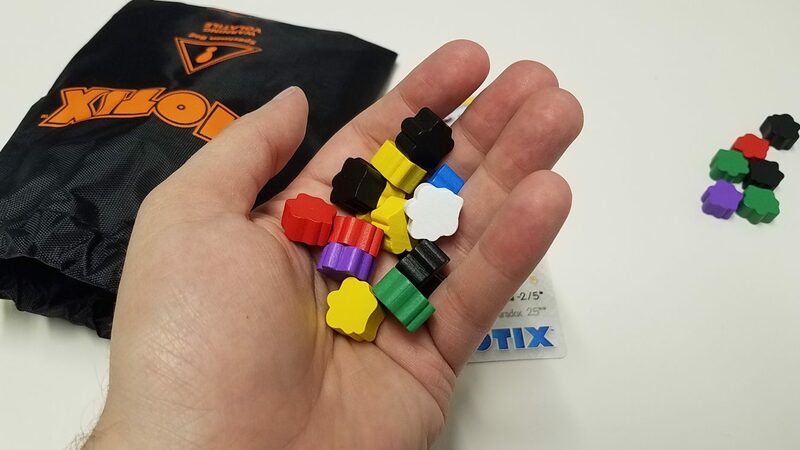 But those quibbles aside, we think that BIOTIX is a solid, cut-throat filler that works well at any player count (more than two is more fun, though) and can easily play with minimal table space, making it good for gaming on the go. If that sounds like your idea of a good time, we totally recommend checking out BIOTIX!